When Jesuits founded Loyola in 1852, they looked to the very heart of their order for inspiration in choosing a name. They found their inspiration in St. Ignatius of Loyola, the founder of the Society of Jesus, and that’s how Loyola—our Loyola—became the first institution of higher education in the United States to bear his name. To this day, we remain committed to the ideals embodied by the members of the Society of Jesus throughout its rich history. Those Jesuit ideals include an emphasis on academic excellence, the importance of the liberal arts, and cura personalis—the education of the whole person. 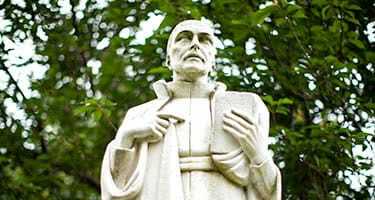 We strive to live up to the ideals set by St. Ignatius, and know they are integral to what Loyola has become. 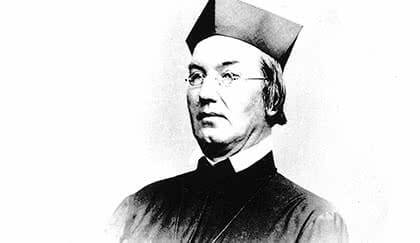 Loyola’s story begins on Sept. 15, 1852, as Loyola College is founded by Rev. John Early, S.J., an Irish-American educator and former president of Georgetown University. It is the ninth oldest American Jesuit institution of higher learning—and the first institution of higher learning in the United States to bear the name of St. Ignatius of Loyola, founder of the Society of Jesus (1540). The college’s first campus was in two large townhouses on Holliday Street, between East Lexington and East Fayette Streets, in downtown Baltimore. Three years after its founding, Loyola relocated to North Calvert Street by St. Ignatius Roman Catholic Church. Loyola establishes the Evergreen campus. 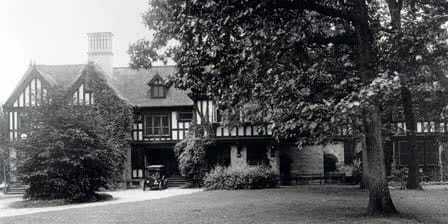 In 1895, a Tudor-style mansion was built by the Garrett family in north Baltimore. This home was intended to be a wedding gift for one of their children; however, the child died during a trip to England. In 1919, the mansion was used as a Red Cross Institute for the Blind and later reconstituted as a rehabilitation center for blinded men during World War I. In 1921, Loyola purchased the property from the Garretts and moved the college from its location on Calvert Street to its current location. Graduate studies begin with Education programs. 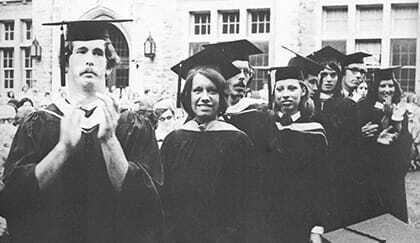 Business management was added to the graduate division in 1968, speech pathology in 1971, and finance in 1973. During those years of academic expansion, Loyola was awarded the Sidney Hollander Award for its contributions to the establishment of civil and political rights for African Americans in Maryland. A Loyola education was exclusive to men for more than 100 years—until Loyola officially becomes a coeducational institution following a merger with Mount Saint Agnes College, an all-women’s Catholic college located in Baltimore’s Mt. Washington neighborhood that began a student exchange program with Loyola College in the early 1960s. The Joseph A. Sellinger, S.J., School of Business and Management is founded. Named after the University’s 22nd president, the Sellinger School offers a rigorous business education inspired by Jesuit traditions and values. The Sellinger School receives AACSB Accreditation in 1988—a distinction held by fewer than 10% of business schools nationwide and fewer than 1.5% worldwide. 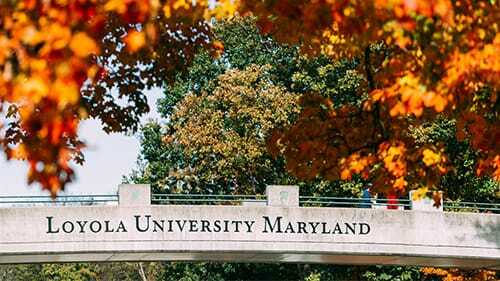 Loyola College adopts a new name and designation, Loyola University Maryland, to reflect the institution’s comprehensive fields of study and graduate programs. Loyola continues to develop and build our Evergreen campus, which has existed for nearly a century, to improve its facilities, to anticipate the future of learning and Jesuit education, and to prepare for the next generation of students. 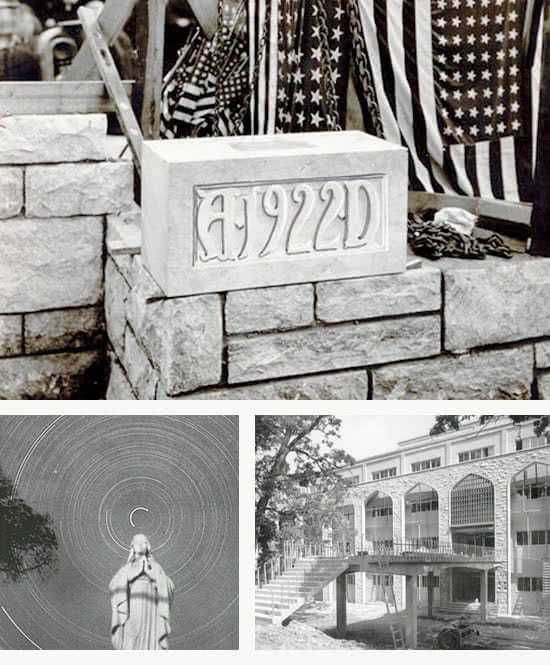 Since 1946, the department of education has been an academic pillar at Loyola. President Brian F. Linnane, S.J., announces the launch of the School of Education to coincide with the University’s designation change. Today the School of Education offers teacher education and education specialty programs at both the undergraduate and graduate levels. Greyhounds attract national attention as Loyola breaks a Guinness World Record for the largest group crabwalk live on The Today Show on March 30, 2017. The prior record to beat: 376 individuals, set by Northeastern University in 2016. Loyola beat—and holds—that record, with 494 people crab walking for two consecutive minutes. 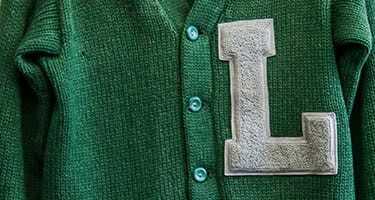 In the early 1920s, as Loyola was developing its athletic teams, uniforms varied from green, red, blue, and white. The student body decided Loyola should have official colors to represent all sport teams and to build Loyola's identity. Grey has long been a traditional color among Jesuit colleges (Georgetown University's colors are navy and grey; Saint Joseph's University's colors are crimson and grey). Green was soon decided to be the second color, and for many years, it was unclear how or why. Then in 1960, during the dedication of a new student center, Monsignor William Sweeney, a 1922 graduate, revealed that he and a group of his friends had come up with green as a counterpart to grey—in part due to their loyalty and love for everything Irish. Loyola's official mascot, the Greyhound, was adopted in 1927. At the time, Baltimore sportswriters were using a variety of nicknames to designate Loyola's athletic programs, including "the Jesuits" and "the Irishmen." Students wanted a distinctive mascot for their sports teams in addition to a name for the school newspaper. 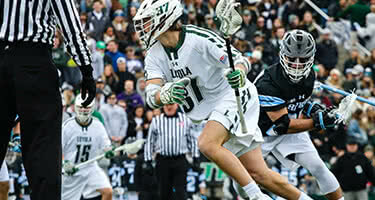 Loyola’s mascot had to embody the school colors, green and grey. Proposals for a mascot included the parrot or parakeet (symbolizing green) and the grey squirrel (leaning more toward grey). Known for its graceful agility and speed, loyalty, and intelligence, someone suggested a Greyhound. The fact that the breed was known to have been bred by the Irish and imported as racing dogs by the ancient Romans meant that the mascot would have a tie to Loyola's Catholic identity as well as to its early founders and leaders, many of whom were of Irish heritage. 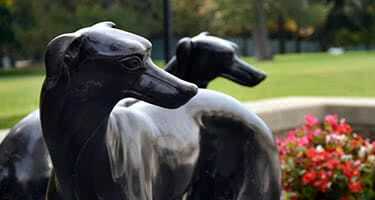 In a vote among the student body, the Greyhound narrowly defeated the grey squirrel to become Loyola's official mascot. Loyola's motto is "Strong Truths Well Lived." 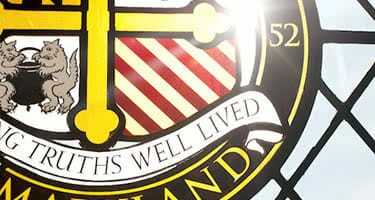 The official seal, which includes the University's shield and features our motto unfurled across the bottom, has been in use since 1853. Loyola's shield is quartered with the lower half reproducing elements from the coat of arms of Saint Ignatius of Loyola, founder of the Society of Jesus and our namesake. These include the two wolves and kettle and the seven maroon and gold diagonals. The upper half of the shield honors our location: the coat of arms of Lord Baltimore and an Evergreen tree on a field of grey to represent Loyola’s Evergreen campus and school colors. 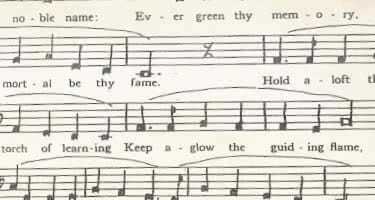 The “Alma Mater Anthem,” sung each year at Commencement, was written by Capt. 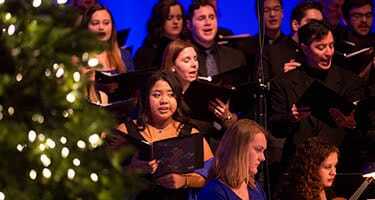 John Ozazewski, a 1940 graduate, and composed by Felice S. Iula, the director of Loyola's glee club at that time. Hear Ryan E. Andrews sing the Alma Mater at Loyola’s 2016 Commencement Exercises below. A staple of the Loyola experience, Midnight Breakfast has been serving up hash browns, scrambled eggs, and French toast sticks in Boulder Café on Friday and Saturday nights for decades, providing a tasty pitstop on students' late-night walk across campus. In recent years, the menu has expanded to include tacos, pizza, and nachos. By popular demand, a special edition of Midnight Breakfast returns for Milestone Reunion for alumni to get their maple syrup fix. For centuries, Catholic schools—and especially Jesuit schools—have marked the beginning of a new year with the Mass of the Holy Spirit. 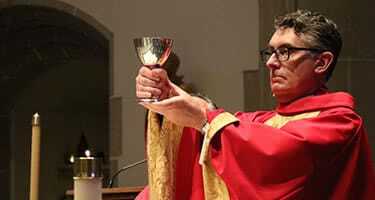 This tradition dates back to the first Jesuit school in Messina, Sicily, in 1548. The Loyola community gathers in Alumni Memorial Chapel the second Sunday in September for music, song, and prayer, as Loyola's president blesses the community for a healthy, productive, fulfilling academic year. The color crimson, worn by the priests concelebrating Mass and decorating the chapel, represents the embrace of the Holy Spirit. Greyhound pride reaches new levels for the annual men's lacrosse matchup against our long-time neighborhood rival, the Johns Hopkins University Blue Jays. The Loyola community gathers in Alumni Memorial Chapel in early December for Lessons and Carols, an ecumenical service rooted in the great English choral tradition that combines seasonal music and scripture readings of the Advent Christmas Season in a beautiful candle-lit setting. During the service, gifts are presented to representatives from local organizations to be distributed to children in the Baltimore area as part of the Presence for Christmas service project sponsored each year by Loyola’s sophomore class and the Center for Community Service and Justice. 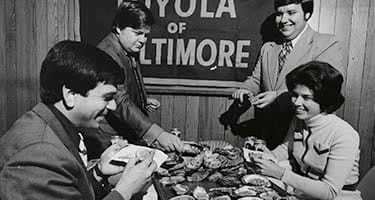 For 70 years, alumni have returned to campus every January to join the current senior class for a night of shucking oysters and delicious food, live music and dancing, casino-style gambling and games, and more. The highlight of the spring semester, Loyolapalooza is an annual concert-carnival-Quad-gathering festival for the entire student body. The event takes place on a Sunday in late April, is organized by the Student Government Association, and features rides, food, and free live music on a giant stage in front of the Humanities building. The winner of Loyola’s Battle of the Bands contest opens the stage for other big-name acts, which in past years have included performers such as Blues Traveler, T-Pain, The All-American Rejects, Augustana, Parachute, Capital Cities, Shwayze, Karmin, Jah Works, and Sean Paul. 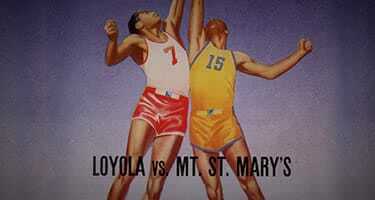 Loyola men's basketball has faced off against Mount Saint Mary's for more than a century—and at one time, this athletics tradition was the longest running basketball rivalry in the state of Maryland. Whether the Clash takes place at Reitz Arena or away, Greyhounds fans will turn out in droves to chant "Beat the Mount." 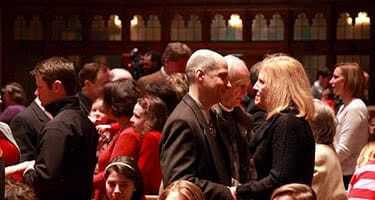 A tradition started in 2011 by a 1999 graduate, Loyola's Alumni Association has invited married Loyola alumni, along with their families, students, and other members of the community, to attend a special Mass at Alumni Memorial Chapel on the Sunday before Valentine's Day, during which they renew their wedding vows. A brunch is held in the Andrew White Student Center following the Mass. 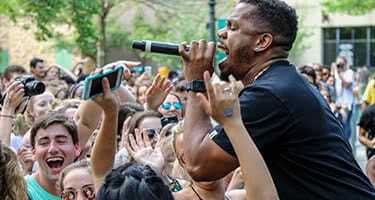 Students wake up—and line up—at dawn to get tickets to this sold-out show every semester. The Belles and the Chimes, Loyola's male and female a capella groups, pull out all the stops for their fall and spring concerts and always leave the audience wanting more. Alumni and their families return to campus for their Milestone Reunion every five years since their graduation to reconnect, remember, and relive their days on Evergreen. Reunion takes place during the first weekend of June each year. Alumni celebrating their 50-year reunion are invited to a special ceremony and a dinner-dance to induct them as Golden Greyhounds. Our namesake and patron saint has watched over students, faculty, and visitors to campus in a special way since the iconic marble statue's installment on the Quad in 1967. A gift from a 1966 graduate who donated the statue in memory of a family member, St. Ignatius has also brought luck to generations of Loyola students who rub his foot before midterm and final exams, before big presentations and interviews, even before exchanging marriage vows in Alumni Memorial Chapel.